My ironing board is mini size and on the floor too! The iron cord is ALWAYS tangles around things too! I am so glad to know I am not the only one! My creative space is a mess. all. the. time. I am so visual that it helps me to have everything laid out so that I can see. When it gets to messy to function, I just pick up and move into the floor on my den! Which leads me to the question…do you work better in a chair at a desk or on the floor where you can get down and dirty? You made me laugh out loud when you mentioned the dorm sized ironing board laying on the floor. You are describing my space!! And next to the board is a tangled pile of cords coming from a well used iron, glue gun and little space heater that I sit next to on the floor as I iron, glue and create. Modest and absolutely useful! I try to organize to a point, but I let it look lived in because like you said, why waste time stressing about messing it all up?! Haha, I'm in this club, too. My desk is always a disaster zone and I don't care at all. I have the tiny ironing board too, must be a pre-req! I was JUST saying yesterday how I wish my studio looked like a Martha Stewart magazine layout, but you have shown me the error of my ways! I will embrace the chaos that is my (very much) working studio. Wow, i'm super happy to hear others have the tiny ironing board as well!! Lilac- let it be lived it- absolutely! I actually based 90% of my decision to go to MassArt based on the messiness of it. I swear, mom can vouch for me. I liked that there was paint and scribble and dried glue all over everything! It made it feel very un-intimidating. This might need its own post! Paige – excellent to have you in the club! keep it messy! This is so funny and totally true. I worked for a lifestyle magazine for a few years and homeowners would clean for weeks before we shot their "Casual just hanging at home" photos. And we usually brought in a stylist too. I have a feeling if we opened any closet doors, we would have been killed with an avalanche of stuff falling out. lulu – happy to know the truth about those magazine shoots! Everything about this post makes me smile :) I also have the tiny ironing board, a tangled iron cord and paint stains everywhere. 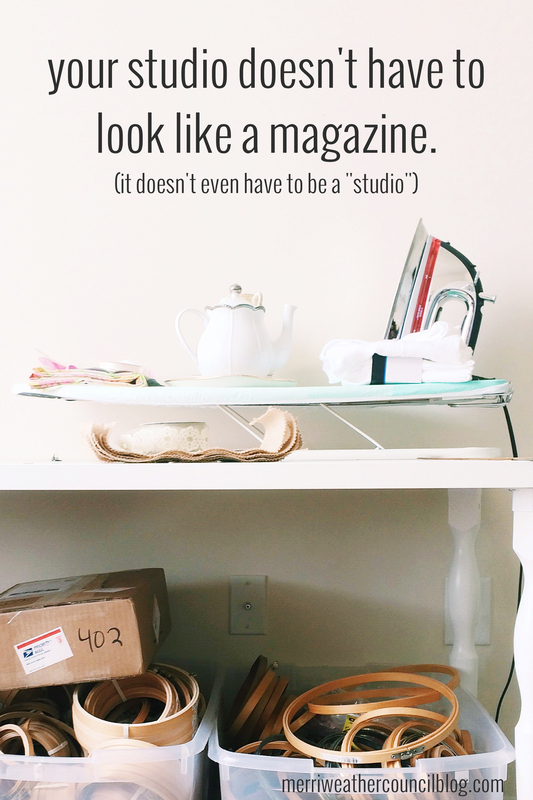 I don't have an actual studio, so I usually work on the floor or couch with supplies piled all around me. 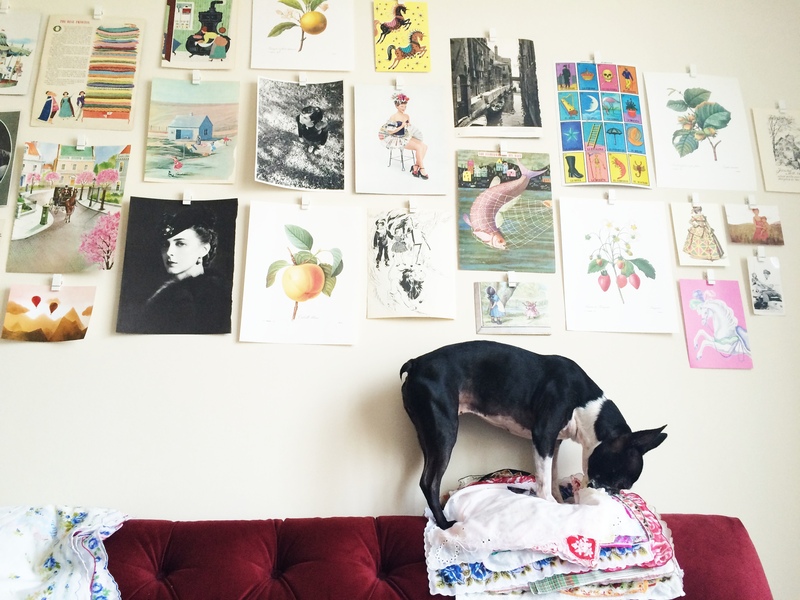 What a relief to know that others have messy creative spaces, too! I always tell Doug "a messy house means we're busy, creating new projects and paying bills"
My studio looks like a tornado came through. And that's how I like it!